Francisco Gallego (Scientific Director, J-PAL LAC), Esther Duflo (Director, J-PAL), and Felipe Kast (Minister of Planning, Chile) at the 2011 Compass Commission conference. 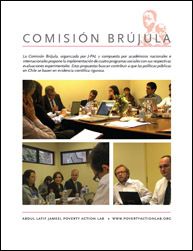 In 2010, the Abdul Latif Jameel Poverty Action Lab (J-PAL) was asked by the Chilean Ministry of Planning to convene a commission of experts to help identify the major social policy challenges in Chile, and to propose innovative programs that could be evaluated using randomized impact evaluations. To this end, J-PAL assembled the Compass Commission, a group of international and local academics, with extensive experience in public policy and experimental evaluations. At a conference on March 10th of 2011, J-PAL presented the Final Report of the Compass Commission to the Ministry of Planning. The Commission proposed the implementation of four social programs accompanied by randomized evaluations to measure the impact of these programs. View coverage of the conference by El Mercurio here, and by Chile's Ministry of Planning here. See the Report Summary in Spanish by clicking icon below. To view the Report Summary in English, click here. To view the conference presentation videos, click here. This proposal aims to understand how greater choice in school selection impacts the educational decisions of low-income families, and ultimately, the academic performance of its members. Households will receive information on their eligibility for the recently created Preferential School Subsidy program, which gives an additional 50 percent increased school subsidy for poor students, and information on schools that can now can be accessed through the benefits of this program. This proposal seeks to increase the quality of education by changing teacher incentives to bolster teaching performance and effort in the classroom. The accompanying study will evaluate the impact on academic outcomes of a program that combines an increase in the number of hours spent by teachers on preparing for classes, with individual monetary incentives tied to student academic performance. This proposal focuses on public safety via strategies for rehabilitation and social reintegration of juvenile and adult offenders. The initiative proposes enhancing the services for rehabilitation and social reintegration at the penal unit level and in juvenile facilities combined, in the case of adults, with training for prison guards on their supporting role in this process. The Commission proposes a multidimensional program that includes job placement, business training, mentoring and access to health services at the school level. The program seeks to facilitate youth access to the labor market and reduce risky behaviors that lead to drug use and teen pregnancy.